When Joe Gough heard the bell, he knew it was time to move. 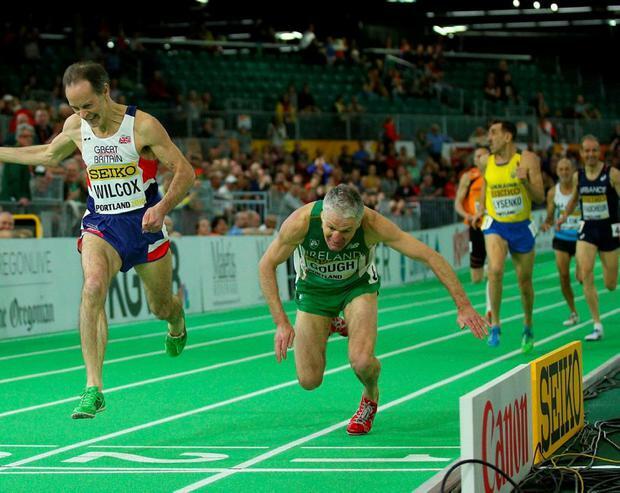 It was last Saturday afternoon in Portland, Oregon, midway through the third day of the IAAF World Indoor Championships, and the 63-year-old from Waterford had 5,000 American fans cheering him along like one of their own. Gough stepped out of the leader's slipstream, pumped his arms like pistons, and swept to the front with a lap to run in the masters men's 800 metres. Up in the stands, the crowd - with Gough's wife Eilis and daughter Sarah flying the tricolour among them - went crazy. Gough rounded the final turn in front, but was being stalked by Britain's David Roy Wilcox, who drew alongside just metres from the finish. The Irishman leaned, lunged, and got a face full of track as he crashed over the line in 2:16.01, a fraction behind Wilcox's 2:15.90. The fans whooped, cheered and clapped, thanking the old-timers for demonstrating that age need not always mean an absence of athleticism. Gough rose to his feet, bloodied, bruised, but still smiling. Most won't know of his exploits, but for two decades now the Dungarvan native has been rejecting time's advances, re-writing record books and winning medals around the world in an Irish singlet. It's little surprise his name is virtually unknown; Gough inhabits a niche corner of a niche sport. Even within athletics, guys like him often have their success dismissed as the desperate plight of a has-been who can't stop, won't stop, or as the vain pursuit of glory by a die-hard never-was. He's used to it, and it doesn't blunt his drive to run faster or - as is the plight of the ageing athlete - to not run slower. "I seemed to blossom after 60," says Gough, who set a world indoor 800m record two years ago for over-60s, running 2:14.06. "It took me 25 years to blossom." Like many successful masters, Gough was a decent, though unexceptional teenage athlete. He took up the sport as an 11-year-old, but by the time he was 19, he'd little more than a few provincial medals to show for his toil. Other sports - and life in general - soon took over. Gough became a guard in Dublin but moved back to Waterford years later to work as a youth development officer which, 35 years on, he's still doing today. After a 15-year hiatus from running, it was a missing link from his youth that brought him back, a lingering itch he never did scratch. "As a youngster I won silver and bronze medals in the 800m at Munster level, but never gold," he says. "I thought: 'I'd love to win a gold.'" At 35, he became eligible to run in masters events, but Gough was only third in his comeback race, the Munster over-35s 800m. "I thought, 'f*** it, a bronze, I'll have to wait another year,' but I got a taste for it then and kept training." At 40, he finished third in his age category at the national championships, running 2:01 for 800m. "I was faster than I was at 19, so things were shaping up nicely," he says. Gough hasn't been beaten in his age group since, and has accrued more than 70 national medals. At the World Masters Championships in Lyon last year, he claimed his first global outdoor title, winning the over-60 800m in 2:15.90. His appetite for competition has taken him around the world - Spain, Sweden, America, Puerto Rico, Russia, Slovenia, and lots more - but it hasn't come cheap. "These things cost money. You find your own accommodation, flights, meals, travel. It's a passion. If you started thinking of the cost, you wouldn't do it." Wife Eilis and daughter Sarah also broke the bank to travel to Portland last weekend, and though many wonder how - or indeed why - Gough can do what he does, to them it all makes sense. "He doesn't think: 'I'm 63 so I should be slowing down,'" says Sarah. "He doesn't care what anyone thinks. He has nothing to stress about because he enjoys it so much." Behind that facade, though, lies a deep yearning. "He's competitive," says Eilis. "I think you have to be. If you don't have that edge, then you don't have what it takes to do the training." Several years ago, while in his mid-fifties, Gough decided to hang up his spikes, but soon realised what life was like on the other side. "When you stop, it shows you how much you miss it and what it means to have it," he says. "Other hobbies are grand, but there was no buzz." Next week, he will get another hit of that buzz when he lines up at the European Masters Indoor Championships in Ancona, Italy. Later this year the World Masters Championships will be held in Perth, Australia, though he's unlikely to make the starting line there, given the cost. And as for the finish line - his own, personal finish line - Gough sees no reason to again consider retirement. "If the buzz goes out of what I'm doing, I'll stop," he says. "But there are fellas out there who would love to do what I'm doing, but can't, because their hip or knee or ankles have given out. A day will come when I can't do it, so why not embrace it and do it for as long as I can?"